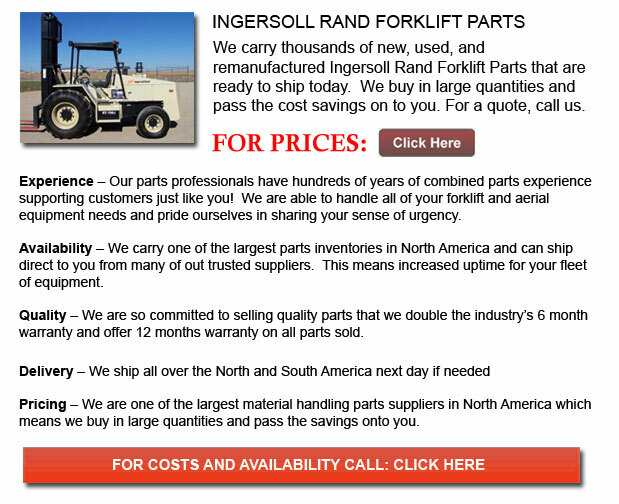 Ingersoll Rand Forklift Parts - Providing solutions, services and products in order to ensure efficiency and to increase the productivity within industrial, commercial and residential surroundings, Ingersoll Rand is very proud provider of products which help enhance the security, health, safety and comfort of individuals all around the globe. The Climate Solutions division provides a world-class product line of energy efficient HVACR solutions for clients. Thermo King is the leader in transport temperature control, while Hussmann is a manufacturer of food merchandising and refrigeration solutions. Trane is a trusted provider of energy efficient heating ventilation and air conditioning systems, contracting and building advanced controls, services and parts support utilized for both residential homes and commercial buildings. Ingersoll Rand's Industrial Technologies division offers products and solutions that enhance their customers' operation, energy efficiency and productivity. The product range is diverse ranging from tools and pumps, fluid and material handling systems to complete compressed air systems. They have likewise developed Club Car, the worldwide leader in utility and golf vehicles intended for businesses and people. Well-known brand names like for instance Trane and Schlage compromise the Residential Solutions business, delivering safety, efficiency and comfort to home owners all across North America. Several of their innovative quality products comprise electronic and mechanical locks, indoor air quality solutions, air conditioning and heating systems, portable security systems, advanced controls and remote home management. Ingersoll Rand' Security technologies provide products which ensure secure, safe and productive surroundings. This division's market leading products include floor and door closers, portable security devices, exit devices, biometric and electronic cabinet hardware, access control systems, steel doors and frames and locks, decorative hardware and locksets. Schlage likewise has products which offer personal, time and attendance scheduling systems.